You are here: Home / Dental operating microscope (D.O.M.) assisted R.C.T. / Pushing Back the Limit to Save Teeth with Opmi Proergo Dental Operative Microscope. 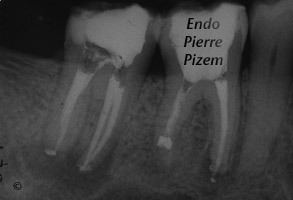 Dental Operating Microscope Assisted Root Canal Procedure on a Completely Stenosed Canal System. Pushing Back the Limit to Save Teeth with Opmi Proergo Dental Operative Microscope. Dental Operating Microscope Assisted Root Canal Procedure on a Completely Stenosed Canal System. Pulp chamber and root canals are not visible on pre operating X Ray of second mandibular molar. 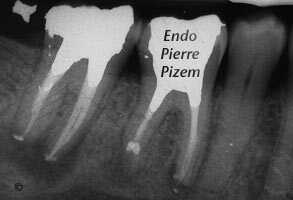 Diffuse calcifications preclude easy canal entries location. 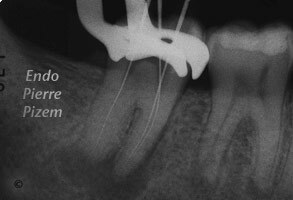 Despite its highly calcified canals, this tooth must not be extracted, it can be saved with a dental operating microscope assisted root canal procedure. 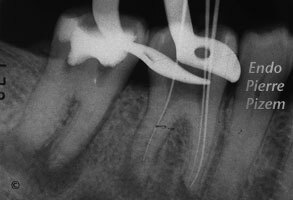 Progressive abrasion of attached pulp chamber calcifications with ultrasonic tips led to the canal entries. Required state of mind: No pushing but resolution. Amalgam post and core build up. This last X ray dental film is a three years post operative control and is showing a complete regeneration of periradicular tissues, teeth are still functional and symptoms free. 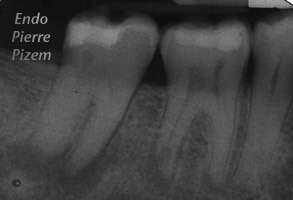 Should an implant have been put there in the first place to replace this second mandibular molar simply because this root canal procedure is extremely difficult to perform? Maybe, maybe not! 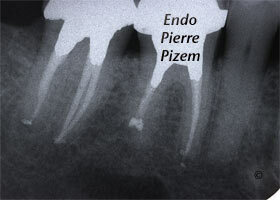 Both implant therapy and endodontics show excellent prognosis. To let the informed patient decide for himself whether or not he want’s to save his tooth instead of having a dental implant is simply common sense.